The title and statuette of the Honorary Sonator was presented to His Holiness the Pope John Paul II on September 5, 2001 at the Vatican by Jacek Łepecki, president of the "Sonata" Bogumił Łepecki Warsaw Symphony Orchestra, son of the Orchestra's founder. Ladies and Gentlemen! It is no coincidence that my humble person represents the Ministry of the Economy on this grand occasion, for the things you do for our Nation's culture also serve to strengthen our economy. It is therefore a pity that the economy is, as of this day, still unable to reward your efforts in full and to provide support to your endeavours. Please allow me, therefore, to share certain observations with all of you here, for on such extraordinary occasion even us economists cannot help but feel moved – and for a number of reasons. The first of those reasons is that once again the beauty that you represent through both your actions and your artistic excellence has prevailed. Secondly, all this is an example of how a family can create something that is both magnificent and timeless. Thirdly – it is an extraordinary day because in normal circumstances gifts are given to those celebrating a jubilee by those attending, and yet here we are, celebrating a jubilee of an entirely different kind, where it is the guests who receive all the gifts – gifts in the form of those 15 years during which you have provided us with all those moving, emotional moments. And even today, as you present these awards, you continue to emphasize this great tradition of giving. I would like to express my deepest gratitude for this, and I am convinced that it is by acting in such manner that you win people over – not just earning their sympathy, but also obliging them to ensure that the "Sonata" never fades away. What a great honour it is! I really do appreciate all this, and ever since that day when I have heard you play – still young fellows at the time – I became convinced that Warsaw has not yet perished, that it will once again emerge strong and engaging, and that Warsaw simply needs the "Sonata" – we all need it so that our hearts can rejoice. I thank you for this from the bottom of my heart. My dear ones! I will speak to the press about all that I have felt today, and then you will know of my feelings, of my gratitude and of my heartfelt joy. But right now I have this pressing desire that we round off this most illustrious event with a prayer, and in this prayer I'd like to thank the Good Lord in Heavens for the fact that you're here, each and every one of you, and that you had the strength and the determination to stand your ground against all odds. It is truly touching to see how a son just won't allow his father's legacy to become lost during this roller-coaster ride we've found ourselves in, and it is for this that I also want to express my gratitude. When I have heard the orchestra play for the first time, and when we spoke later on, this conversation I've had with you – celebrating a "little jubilee" of your own today too, one might say – has been a great solace to me, letting me know that in all this hustle and bustle we're living today, there is still somebody who cares, who's still willing and who has no intention of letting it go, even despite all the hardships that lay ahead. And so this event is of great importance to me, uplifting to the spirit in a way that other such events, less successful than this one, have never been able to provide. So now I ask God Almighty – perhaps we shall all stand now and say this, say thanks to our Good Lord for all that we have experienced today, hoping that your work will carry on and we shall know how important it is. This – and the gift which I shall bring to you, I am soon to visit the Jasna Góra Monastery, to pray for those who died, especially those who have perished on the Golgotha of the East, where there is no place for anybody to light a candle in remembrance, and so we must remember them in our prayers. This is why I shall visit the Monastery on the first and the second day. And so I thank you, Jesus Christ, I thank you for all this. And the Blessed Virgin Mary, for these anthems were also sung in praise of your name, and so with these words to you we now turn: "Ave, Maria..." I want to ask you to do one more thing. The next time you pay a visit to the Vatican, take this to His Holiness and tell him that the world knows no other Sonator such as Him, and this shall be your cry of joy and your homage to Him. God bless you all. WARSAW, NOVEMBER 13, 2001 – THE MUSEUM OF THE JOHN PAUL II COLLECTION, DURING A SYMPHONIC PERFORMANCE FORMING PART OF THE NATIONAL INDEPENDENCE DAY CELEBRATIONS, UNDER THE HONORARY AUSPICES OF MR JANUSZ STEINHOFF, VICE-PRESIDENT OF THE COUNCIL OF MINISTERS. To receive the title and the statuette of the Honorary Sonator on the National Independence Day and in the presence of such noble individuals is a great honour for me, and I accept this title with great satisfaction. I do so firstly because the Polish Oil and Gas Company, being a state-owned corporation, lends its support to the activities of the Orchestra aimed at promoting Polish culture, and secondly – because, as the Greek philosopher Hippocrates once said, "Ars longa, vita brevis – Art is long, life is short". 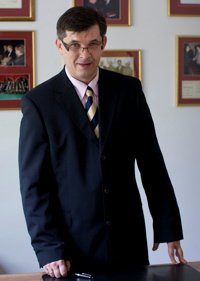 And finally – because the "Sonata" Warsaw Symphony Orchestra, being a family enterprise initiative, is an example which proves that the National Culture – which is, in this case, being enriched through the endeavours of a father-and-son team – can serve the Polish economy so successfully on an international forum, losing nothing of its value. And it is for all this that I wish to thank Mr Bogumił Łepecki and Mr Jacek Łepecki from the bottom of my heart. THE STANISŁAWOWSKI THEATRE, THE ŁAZIENKI PARK IN WARSAW, 1998, DURING THE GALA HELD TO CELEBRATE THE 55TH ANNIVERSARY OF BOGUMIŁ ŁEPECKI'S CREATIVE WORK, 15TH ANNIVERSARY OF THE FOUNDATION OF THE ORCHESTRA AND 10TH ANNIVERSARY OF DIRECTOR JACEK ŁEPECKI'S MANAGERIAL WORK, UNDER THE HONORARY AUSPICES OF HIS EMINENCE CARDINAL JÓZEF GLEMP, THE PRIMATE OF POLAND. Words of gratitude from Professor Marek Kwiatkowski, Ph.D.
To receive the Honorary Sonator title and award is truly a remarkable privilege. For here you are – father and son – you, who have not only stood guard for our national traditions, who have made contributions towards the development of the Polish culture through the magnificent medium of music – a language understood all across the world – and who have cultivated the traditions of the Polish arms and war effort, providing an example of how a non-government organization should cooperate with the Ministry of Defence, but who now have also found a way to lend spiritual support to the Minister of National Defence of the Republic of Poland. I wish to express my utmost gratitude for all that is good and beautiful in the efforts you have made – efforts which are of such great value for a Nation in a state of rebirth. In expressing my gratitude for this eminent distinction, which to me has a particularly substantial value in symbolic terms, I would like to say that Mr Bogumił Łepecki and Mr Jacek Łepecki have proven that they are adept at engaging the people of science into a common effort made for the sake of Polish culture. I have accepted the invitation to join this effort many years ago, and therefore I am delighted that, together with all of you, I have the privilege to celebrate this magnificent jubilee, paying homage to both Mr Bogumił Łepecki, Mr Jacek Łepecki and the Orchestra itself. Once again I ask that you accept my most sincere thanks. AUGUST 15, 2011 – WARSAW – THE CHURCH OF DIVINE ASCENSION, IN THE COURSE OF A CONCERT PERFORMED DURING THE POLISH ARMED FORCES DAY, COMMEMORATING THE 1920 BATTLE OF WARSAW, THE "MIRACLE AT THE VISTULA". Receiving the title and award of the Honorary Sonator and joining such noble ranks of other individuals holding it, I am overjoyed that, as a Warsaw local government activist, I was able to lend support to the “Sonata” Bogumił Łepecki Warsaw Symphony Orchestra, which for over 25 years now has served the Capital City of Warsaw so wonderfully with both its artistry and its attitude. I thank you from the bottom of my heart for this beautiful gesture of remembrance. After receiving the Honorary Sonator title and award, Professor Zygmunt Mierczyk, D.Sc., Chancellor and Commanding Officer of the Military University of Technology, expressed his gratitude in the following words: I would like to thank Mr Jacek Łepecki for this great distinction; it is of extraordinary value and importance to me, and I am glad that I have the privilege to join the ranks of the HONORARY SONATORS OF THE "SONATA" SYMPHONY ORCHESTRA, becoming a member of a noble congregation of distinguished individuals who have made invaluable contributions to the life of our Country.